The Country Women’s Association are probably best known in Australia for providing afternoon teas at shows, both in the country and for the city shows. Their members always exhibit their cooking at the shows and they usually win plenty of prizes too. 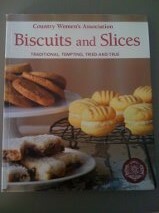 The CWA Biscuits and Slices recipe book is my favourite sort of cook book. To begin with, there is a photo of every single recipe in the book, so you know what you are aiming forwhen you start cooking. The next great thing is that the biscuits and slices photographed are presented simply and don’t look chocolate-box perfect, so you know you have a good chance of getting your efforts to turn out like the photo. The third thing is, the recipes from the CWA are absolutely fool proof. Simple methods and simple instructions. Lastly, you never have to chase around trying to find some ridiculously exotic ingredient or other to make one of the CWA recipes, in fact chances are that even if you’re not really a cook, you will still have all of the ingredients right there in your cupboards (possibly with weevils, but you can sift them out – joke). The book contains old favourites like Rock Cakes, Yo-Yo Biscuits, Jam Slice and Afternoon Tea Fingers. There are recipes for Greek Shortbread and three different Apricot Slices. I’ve put markers on a few pages with the intention of giving these recipes a whirl sometime. I was waiting in the check out queue at the supermarket recently and talking to the woman in front of me, (as you do, when the queue is long), when I noticed she had ready-made vol au vent cases in her trolley. I asked her what she filled them with and she said, “cut-up a chicken and pour in a tin of soup, then top the lot with cheese and bake them in the oven”. Inspired, I asked her to watch my trolley while I ran back to the bread aisle and grabbed a packet of vol au vent cases for myself. When it came to the crunch, I made up my own recipe for a filling. I knew Miss S would never eat anything which she knew had cheese in it, so I had to be creative. Place the vol au vent cases on an oven tray and mix all of the other ingredients together. Spoon into the vol au vent cases and bake at 170 degrees Celsius for 15 minutes. Easy-peasy.